My girls and I have spent nearly a year sharing our fun (and sometimes clever) frugal ideas with all of you in this blog, and maybe it seems that all we care about is saving money. Not true! In fact, the main reason we use coupons, pay off debt, look for the best deal or do without, is so that when we REALLY want to spend money on something important or fun -- we can! All without fear or regret -- or using a credit card. For instance, last Saturday was my husband's birthday. At our house, birthdays are a big deal. For the first 20+ years of our marriage, a "big deal" meant breakfast in bed, a few brightly wrapped presents, Grannie's homemade cherry chocolate cake, and crepe paper streamers and balloons hung from the kitchen light. But now that the house is paid off and most of our children are raised, we have really beefed up our celebrations! For the past 5 years, David and I have flown to Los Angeles, rented a snappy convertible, stayed at the super-ritzy Ritz-Carlton, and spent one delightful evening eating filet mignon and watching world-class magic at The Magic Castle in Hollywood. For my husband who has loved magic since he was a teenager, this is a dream come true! In fact, after our first trip, he said, "We could do this trip every year for my birthday for the rest of my life and I would be happy." And maybe we just will. This trip is not cheap, as you might have guessed (although, we do fly free with our Rapid Rewards points from Southwest Airlines, and I pre-pay our hotel room which saves us $30/night, and Merrick's darling husband gets us the family discount on our rental car through his job), but even with those deals, this trip costs quite a few pretty little pennies. But because we watch all of our pennies during the rest of the year, we can take this wonderful trip every October and never think twice. What would be the point of scrimping and saving, just to end up like Ebenezer Scrooge with piles of money, but no happiness? That's not the goal at all. One of our beloved religious leaders, Russell M. Nelson, once said, "Money is a library card to experience." We remind ourselves of this often. You only live once. Don't squander your precious and hard-earned resources so that you can never have the experiences or things that will have made your life worth living. This is the whole purpose of being frugal. 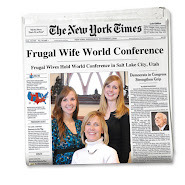 This is the whole idea behind this blog: Be that Frugal Wife, so you can have that Wealthy Life. Whatever that might mean to you. Labels: Goals, Holidays, Travel, Why Be Frugal? I love the philosophy and I love the Russell M. Nelson quote. It is always fun to read your blog and pick up a few tips, and just to know that there are others out there having fun while being frugal. Love this. This is what we did in my family growing up and what I hope to do with my family in the future. The reason DH & I decided to get out of debt is because we didn't want money to ever limit where we go in life or what we can accomplish. Love this post! KUDOS!!! There are scientific studies out that THINGS do not equate happiness but rather EXPREINCES since they make memories that last forever! I agree! We plan on traveling a LOT out of the country someday, so we clip coupons now (And we will forever) but you do need to prioritzie what you REALLY want and figure out a way to get there. As long as you are financially fit (which you guys are a great example) then live life a little! :) this is SO TRUE! What a great reminder. Sometimes I can definitely lose sight of why I get up earlier to make my lunch to take to work, or why I spend time clipping coupons when I could be reading a book. Oh yeah, it's our yearly trip to Cabo! I couldn't agree more! The point of this crazy ride is to enjoy life. If you're weighed down with debt and in over your head, that's not enjoyable. And if you sock away every penny and never do anything fun, that's not living either. You save so you can do something fun without the weight of debt being attached to it. Good for you!